UPDATE 11/23/15: Recently I discovered a whole new way to send group emails using Inbox by Gmail. No need to leave Inbox like the two suggestions below. Instead you can install a really useful Chrome Extension called MixMax. MixMax is a full productivity suite for Inbox and Gmail. You can see my complete review of MixMax here. Essentially, when you have MixMax installed, all that is needed to send group emails in Inbox is for you to type the name of the Group in the To, CC, or BCC field and send away. As in classic Gmail with group emailing, this feature still results in all of the group members' email addresses being entered into the To:/CC/BCC field. Below you can see what is would look like. 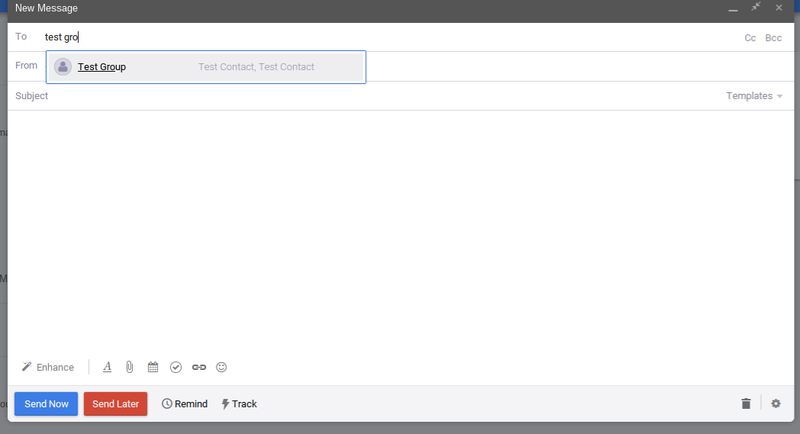 You will also notice some other features that MixMax adds to the Inbox compose screen. You can install MixMax right here. UPDATE 9/13/15: Apparently the contacts team has made some changes and removed the email icon from the groups page. to overcome this missing icon, select the contact group you want to email, choose one contact, then at the top where you see 1 select, choose select all. Next you can click on the three dots at the top right and choose email. As all of you are aware, Inbox by Gmail currently does not support group emailing. Well, I am here again to provide you all with a really great workaround to accomplish this. This workaround actually uses Gmail to send the message but you don't have to switch to Gmail to perform this task. Go to inbox.google.com. Click on the Contacts link on the left. Once the contacts tab opens, go to Groups, and click on the group you want to email. The screen on the right will list all of the members of that group. At the top you will see a black envelope. Click that to email the group. A Gmail compose window will appear with all of the members populated in the To: field. Here you can draft and send your email to the entire group. 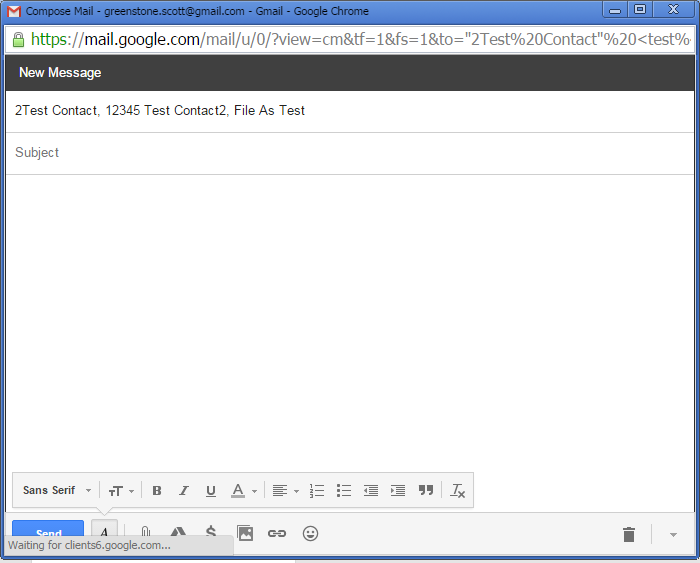 Once you are done, you can go back to the Inbox tab and you will see your email in the Sent label on the left. And there you have it, another simple workaround to make Inbox by Gmail work for you. "A Gmail compose window will appear with all of the members populated in the To: field." All the members were populated in the "To: field".....I've right clicked and only get a "copy" choice....not a "cut" choice....then I pasted to the BCC....but I can't Cut the "To" members.....and the BCC that I pasted have red dots under them. Have been looking around for a solution to the same problem, the only one that worked. Thanks Scott. btw, you don't need to install MixMax do you? Wait, there is no black envelope on my screen. What now? You are right. That works. Is there an easier way to select all without having to click each person in the group? I don't see any of that stuff you are talking about but my group names go in now. Did they change again??????? Are you using the New Contacts Preview or the old contacts? Neither inbox or gmail have group emailing capabilities in the mobile app/. Good workaround but why does Google have groups and then make it difficult to send a group email. Seems a step backwards. Inbox is still sort of in beta and new features and capabilities are coming out all the time. "all the time" is perhaps a bit generous. Inbox has been out for nearly 2 years, and we're still waiting for this fundamental feature. Actually new features do come out almost every other week. why not one of the most basic features: send to a group !!! Unfortunately there's still no way to forward an email to a group. This limitation plus the lack of contact group support on Android makes me wonder if there's some bigger picture of Google's idea of how to find and use contacts that I'm not getting. Correct, that is not included. Also there is no group email support in classic Gmail mobile either. No, that's no good. I'll live without inmail 'til it's more user friendly. What am I doing wrong!? That black envelope symbol doesn't show up in my inbox contacts. Is there any setting that I should have setup? Does MixMax exist as an Android App? It seems that MixMax does not sync with Gmail groups without making a request to MixMax. That's a deal breaker for me. Usually, users label, archive or filter to organize their emails, but with this trick you can manage emails by prioritizing and categorizing them into groups. Am I missing something? Seems too complicated. Why not just got to the old Gmail screen when sending to a group. Much quicker. Perhaps I have missed the point or the benefit? Only Google would fail to implement such basic functionality that would take a developer an afternoon of coding. Unreal! Scott can you help me. I have some series of same mail. I could not find out the starting mail which is having some important attachment. how do I retrieve the attachment. Just wanted to write a comment of thanks for posting this. This is precisely what I needed and perhaps wouldn't have found it otherwise. I did install the MixMax addon, but it seems a lot of overkill (and 12 $ a month) for 'just' get the mail-to-group functionality back. If i look at all the posts / threads about this issue from more then a year ago. I can't get my head around it ... Why isn't Google implementing this functionality in Inbox ???? it's so basic. Click #1: Contacts; click #2: Groups; click #3: my particular group; click #4: click the 1st person in my group; click #5: click the dropdown icon next to the light blue link that appeared above (1 selected); click #6: Select All; click #7: the more actions (shishkabob) icon; click #8: Email. 8 clicks to do one task. If I had the coding prowess, I would assume that emailing a group would be something people would want to do, and I would allow the To field in an email to search by contact AND by group. I would also allow the user to see an email link the moment they select the group (that would be click #4: half of the clicks from Google's UX folks' decision to make it convoluted (was that too sarcastic?). I thought inbox was Google's way of simplifying your email inbox? What if you don't have the black envelope? My screen doesn't offer that. I just have to say that your suggestion was incredible and works great! I hated having to go back to gmail to send an email to my basketball group every week. It works like a charm now, right inside my inbox! you are the man!!!! My Inbox doesn't have an email option under the three dots anymore. I do have a little black envelope to click. It conveniently opens an email in the email client I have on my computer (personal) rather than in the gmail account (school) that I am trying to send from. This makes no sense to me. Why would I want to use a different program and email address to send an email from a gmail account. Does anyone address these concerns for the Inbox App? I came here to vent - what on earth is the point in having a contacts manager if you can't actually do anything with it when they're managed? Is this the approach Google are now taking (much like Apple) where they are deciding how we should be working (or 'not' in this case)? I can now send emails to my groups. If you select the people you want to send to or all the contacts in a group, after selecting some the option to send email shows up. Interestingly, I have several gmail accounts and it doesn't show up visually the same in all of them. Sometimes it's at the very far right, other times it's just to the right of the click boxes. Scott, can you please help me show group title in Inbox (in the title of received email)?